Dzogchen Monastery is pleased to announce that the 17th Annual Retreat will take place from 7th to 17th January 2018. 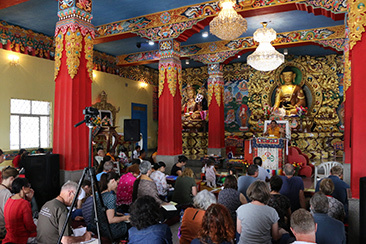 At this auspicious retreat at Dzogchen Monastery, the heart of one of the highest lineages in Tibetan Buddhism, His Eminence the 7th Dzogchen Rinpoche, Jigme Losel Wangpo, will continue his cycle of Dzogchen teachings on the bardos, the four intermediate states of life and death and how we can use them as an opportunity for liberation and enlightenment. Dzogchen Rinpoche will teach on the experiences before, during and after death, preparing us for this time so that we can face it with confidence and ensure we are able to go through these experiences peacefully. In this context, Dzogchen Rinpoche will introduce knowledge and skilful means that can let the last moments of our life become an opportunity for enlightenment, rather than going through fear and confusion. This 10 Day retreat led by His Eminence Dzogchen Rinpoche is a real opportunity for all. New students are welcome to participate to gain a deeper understanding on how to integrate the spiritual into their daily life. This year's Gyalwa Dzogchenpa Drubpa Na Sel will be held at Dzogchen Monastery from 31st December 2017 to 5th January 2018. It will be great opportunity for all of us to enjoy the immeasurable benefits of the ritual practice of the Dzogchen tradition. 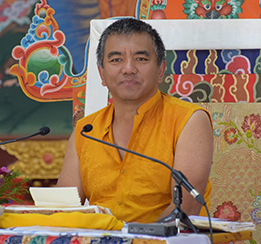 We will practise for a period of five days preparing the ground and creating the auspicious circumstances in ourselves and the environment for the precious teachings of the tradition of the 7th Dzogchen Rinpoche, Jigme Losel Wangpo to take place during the 17th Annual Retreat and to further spread and flourish to be most beneficial for all. These five days of practice will remove obstacles that could arise to prevent us from receiving the transmission itself, such as not understanding or missing the point, and they will enable each of us to connect more deeply with the Dzogchen lineage and receive its tremendous blessings. The practices for this special occasion will be chosen by Dzogchen Rinpoche himself, and will be guided by a team of monks from Dzogchen Monastery as well as senior students of the Gyalwa Dzogchenpa Sangha. New students are welcome and will be supported to participate in all practices.